Brandon Moss - 1B STL Fanduel: 3900 Draftkings: 4900 - Moss goes against Adam Morgan at Citizens Bank Park (Philadelphia, Pennsylvania). Morgan has an ERA against lefties of 3.86 with a wOBA of 0.359. Also he isn't getting it done at home. His ERA at home is 6.81 and his wOBA is 0.398. 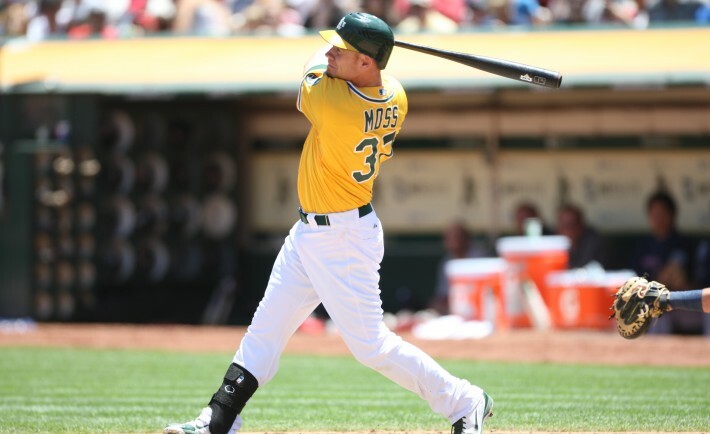 During the prior 7 days Moss has scored 18.8 Fanduel fantasy points while his season average is 10.5. He has a batting average of 0.333 and a slugging percentage of 0.762 over that time. He also has hit 3 homeruns. Moss on the road is awesome and his ISO is 0.333 and has a wOBA of 0.425. Mike Napoli - 1B CLE Fanduel: 3700 Draftkings: 5200 - Napoli goes against Francisco Liriano at Progressive Field (Cleveland, Ohio). This game has a high over under of 9.5, so expect a lot of runs to happen! Liriano has an ERA against righties of 5.83 with a wOBA of 0.365. on the road. His ERA on the road is 6.23 and his wOBA is 0.380. Napoli at home is great! His ISO is 0.333 and has a wOBA of 0.443. Napoli hits lefties extremely hard. His ISO is 0.265 and has a wOBA of 0.398. Chris Davis - 1B BAL Fanduel: 3400 Draftkings: 4300 - Davis will face Collin McHugh at Oriole Park at Camden Yards (Baltimore, Maryland). McHugh has an ERA against lefties of 4.90 with a wOBA of 0.354. In addition he really has been pretty weak on the road. His ERA on the road is 5.23 and his wOBA is 0.352. Throughout both of their careers, Davis has faced Collin McHugh 8 times with a slugging percentage of 0.625 with 1 homeruns. Over the last week Davis has scored 16.5 Fanduel fantasy points while his season average is 11. He has a batting average of 0.263 and a slugging percentage of 0.895 over that time. He also has hit 4 homeruns. Davis at home is money. His ISO is 0.223 and has a wOBA of 0.332. Davis hits righties very hard. His ISO is 0.242 and has a wOBA of 0.339. Joey Votto - 1B CIN Fanduel: 3800 Draftkings: 5300 - Votto squares off verse Bud Norris at Great American Ball Park (Cincinnati, Ohio). There's a high over under on this game, 9.5, Norris has an ERA against lefties of 5.59 with a wOBA of 0.378. He really isn't doing well on the road. His ERA on the road is 6.14 and his wOBA is 0.379. During his career, Votto has faced Bud Norris 15 times with a slugging percentage of 0.667 with 1 homeruns. Votto at home is money. His ISO is 0.216 and has a wOBA of 0.386. Votto hits righties big time, to the tune of an ISO of 0.226 and has a wOBA of 0.414. Really try to get him into your lineups. Marwin Gonzalez - 1B HOU Fanduel: 2700 Draftkings: 4200 - Gonzalez is facing Wade Miley at Oriole Park at Camden Yards (Baltimore, Maryland). Miley has an ERA against switch hitters of 5.46 with a wOBA of 0.354. Also he isn't getting it done at home. His ERA at home is 5.16 and his wOBA is 0.348. During his career, Gonzalez has faced Wade Miley 12 times with a slugging percentage of 0.833 with 1 homeruns. Gonzalez hits lefties extremely hard. His ISO is 0.203 and has a wOBA of 0.32. Jose Altuve - 2B HOU Fanduel: 4000 Draftkings: 5500 - Altuve is facing Wade Miley at Oriole Park at Camden Yards (Baltimore, Maryland). Miley has an ERA against righties of 5.46 with a wOBA of 0.354. He really isn't doing well at home. His ERA at home is 5.16 and his wOBA is 0.348. During their career, Altuve has faced Wade Miley 18 times with a slugging percentage of 0.944 with 1 homeruns. Altuve on the road is great! His ISO is 0.211 and has a wOBA of 0.47. Altuve hits lefties big time, to the tune of an ISO of 0.235 and has a wOBA of 0.46. He has a nice matchup today. Brian Dozier - 2B MIN Fanduel: 3900 Draftkings: 5000 - Dozier will face Edinson Volquez at Kauffman Stadium (Kansas City, Missouri). Volquez has an ERA against righties of 5.28 with a wOBA of 0.325. His ERA at home is 4.04 and his wOBA is 0.304. During the prior 7 days Dozier has scored 20.3 Fanduel fantasy points while his season average is 12.2. He has a batting average of 0.346 and a slugging percentage of 0.885 over that time. He also has hit 4 homeruns. Dozier on the road is great! His ISO is 0.299 and has a wOBA of 0.386. Dozier hits righties extremely hard. His ISO is 0.231 and has a wOBA of 0.341. Matt Carpenter - 2B STL Fanduel: 3900 Draftkings: 4800 - Carpenter will face Adam Morgan at Citizens Bank Park (Philadelphia, Pennsylvania). Morgan has an ERA against lefties of 3.86 with a wOBA of 0.359. Also he isn't getting it done at home. His ERA at home is 6.81 and his wOBA is 0.398. Carpenter on the road0.321 and has a wOBA of 0.409. Carpenter hits lefties very hard. His ISO is 0.174 and has a wOBA of 0.366. His matchup it too much to overlook. Jason Kipnis - 2B CLE Fanduel: 3600 Draftkings: 5100 - Kipnis will be taking on Francisco Liriano at Progressive Field (Cleveland, Ohio). There's a high over under on this game, 9.5, so I think you should expect a lot of fantasy points being scored. Liriano has an ERA against lefties of 4.25 with a wOBA of 0.331. Additionally, he isn't doing well on the road. His ERA on the road is 6.23 and his wOBA is 0.380. Kipnis has scored 13.8 Fanduel fantasy points while his season average is 11.6. He has a batting average of 0.440 and a slugging percentage of 0.720 over that time. Kipnis at home crushes it. He has an ISO of 0.231 and has a wOBA of 0.376. Kipnis hits lefties in a big way, with an ISO of 0.189 and has a wOBA of 0.361. He should be in for a great game as long as he is starting. Jonathan Schoop - 2B BAL Fanduel: 3000 Draftkings: 3800 - Schoop will face Collin McHugh at Oriole Park at Camden Yards (Baltimore, Maryland). McHugh has an ERA against righties of 4.54 with a wOBA of 0.347. In addition he really has been pretty weak on the road. His ERA on the road is 5.23 and his wOBA is 0.352. Through the last seven days, Schoop has scored 9.9 Fanduel fantasy points while his season average is 9.5. He has a batting average of 0.261 and a slugging percentage of 0.435 over that time. Schoop at home is money. His ISO is 0.206 and has a wOBA of 0.354. Schoop hits righties very hard. His ISO is 0.202 and has a wOBA of 0.345. He has a great matchup today. Jedd Gyorko - 3B STL Fanduel: 2900 Draftkings: 4100 - Gyorko will go against Adam Morgan at Citizens Bank Park (Philadelphia, Pennsylvania). Morgan has an ERA against righties of 7.47 with a wOBA of 0.403. Also he isn't getting it done at home. His ERA at home is 6.81 and his wOBA is 0.398. Through the times they faced eachother, Gyorko has faced Adam Morgan 8 times with a slugging percentage of 0.250. Through the last seven days, Gyorko has scored 17.6 Fanduel fantasy points while his season average is 8. He has a batting average of 0.278 and a slugging percentage of 0.778 over that time. He also has hit 3 homeruns. Gyorko on the road is money. His ISO is 0.255 and has a wOBA of 0.333. Manny Machado - 3B BAL Fanduel: 4000 Draftkings: 4900 - Machado will be pitted against Collin McHugh at Oriole Park at Camden Yards (Baltimore, Maryland). McHugh has an ERA against righties of 4.54 with a wOBA of 0.347. Also he has not done well on the road. His ERA on the road is 5.23 and his wOBA is 0.352. During their career, Machado has faced Collin McHugh 12 times with a slugging percentage of 0.417. Machado at home is great! His ISO is 0.268 and has a wOBA of 0.399. Machado hits righties big time, to the tune of an ISO of 0.264 and has a wOBA of 0.383. He has a nice matchup today. Josh Donaldson - 3B TOR Fanduel: 4100 Draftkings: 5200 - Donaldson will be battling Trevor Bauer at Progressive Field (Cleveland, Ohio). Look for some runs with an over under of 9.5, so expect a lot of runs to happen! Bauer has an ERA against righties of 3.88 with a wOBA of 0.297. His ERA at home is 4.91 and his wOBA is 0.323. Donaldson on the road crushes it. He has an ISO of 0.269 and has a wOBA of 0.398. Donaldson hits righties big time, to the tune of an ISO of 0.276 and has a wOBA of 0.397. This guy should crush it today if he is starting. Kris Bryant - 3B CHC Fanduel: 4800 Draftkings: 5600 - Bryant will be pitted against Tyler Anderson at Coors Field (Denver, Colorado) which ranks number 1 in runs scored and number 2 in home runs allowed. The over under on this game is huge, at 11, so expect some runs to be scored. Anderson has an ERA against righties of 4.41 with a wOBA of 0.324. His ERA at home is 3.04 and his wOBA is 0.308. Over the last 7 days Bryant has scored 21 Fanduel fantasy points while his season average is 13.8. He has a batting average of 0.481 and a slugging percentage of 0.889 over that time. He also has hit 2 homeruns. Bryant on the road0.274 and has a wOBA of 0.421. Bryant hits lefties big time, to the tune of an ISO of 0.318 and has a wOBA of 0.431. Todd Frazier - 3B CWS Fanduel: 3600 Draftkings: 3700 - Frazier will be pitted against Kendall Graveman at U.S. Cellular Field (Chicago, Illinois) which ranks number 8 in runs scored and number 13 in home runs allowed. Look for some runs with an over under of 9.5, so expect a lot of runs to happen! Graveman has an ERA against righties of 4.57 with a wOBA of 0.307. Additionally, he isn't doing well on the road. His ERA on the road is 5.64 and his wOBA is 0.370. Frazier at home is money. His ISO is 0.239 and has a wOBA of 0.319. He has a nice matchup today. J.J. Hardy - SS BAL Fanduel: 2300 Draftkings: 2900 - Hardy goes against Collin McHugh at Oriole Park at Camden Yards (Baltimore, Maryland). McHugh has an ERA against righties of 4.54 with a wOBA of 0.347. He really isn't doing well on the road. His ERA on the road is 5.23 and his wOBA is 0.352. Over the last 7 days Hardy has scored 11.4 Fanduel fantasy points while his season average is 8.1. He has a batting average of 0.273 and a slugging percentage of 0.636 over that time. He also has hit 2 homeruns. Hardy hits righties in a big way, with an ISO of 0.143 and has a wOBA of 0.32. Troy Tulowitzki - SS TOR Fanduel: 3100 Draftkings: 4800 - Tulowitzki faces Trevor Bauer at Progressive Field (Cleveland, Ohio). 9.5, Bauer has an ERA against righties of 3.88 with a wOBA of 0.297. His ERA at home is 4.91 and his wOBA is 0.323. During the past week Tulowitzki has scored 13.1 Fanduel fantasy points while his season average is 10.4. He has a batting average of 0.375 and a slugging percentage of 0.625 over that time. He also has hit 2 homeruns. Tulowitzki on the road crushes it. He has an ISO of 0.233 and has a wOBA of 0.345. Tulowitzki hits righties big time, to the tune of an ISO of 0.222 and has a wOBA of 0.336. Look for a big game. Francisco Lindor - SS CLE Fanduel: 3600 Draftkings: 4800 - Lindor squares off verse Francisco Liriano at Progressive Field (Cleveland, Ohio). The over under on this game is huge, at 9.5, so expect a high scoring game. Liriano has an ERA against switch hitters of 5.83 with a wOBA of 0.365. on the road. His ERA on the road is 6.23 and his wOBA is 0.380. Lindor has scored 12 Fanduel fantasy points while his season average is 11.2. He has a batting average of 0.414 and a slugging percentage of 0.517 over that time. Lindor at home is awesome and his ISO is 0.173 and has a wOBA of 0.389. Lindor hits lefties big time, to the tune of an ISO of 0.127 and has a wOBA of 0.336. He has a great matchup today. Carlos Correa - SS HOU Fanduel: 3900 Draftkings: 5000 - Correa will go against Wade Miley at Oriole Park at Camden Yards (Baltimore, Maryland). Miley has an ERA against righties of 5.46 with a wOBA of 0.354. He's playing poorly big time at home. His ERA at home is 5.16 and his wOBA is 0.348. Correa on the road crushes it. He has an ISO of 0.229 and has a wOBA of 0.381. Correa hits lefties in a big way, with an ISO of 0.147 and has a wOBA of 0.33. Look for a big game. Evan Gattis - C HOU Fanduel: 3000 Draftkings: 4300 - Gattis will face Wade Miley at Oriole Park at Camden Yards (Baltimore, Maryland). Miley has an ERA against righties of 5.46 with a wOBA of 0.354. Also he has not done well at home. His ERA at home is 5.16 and his wOBA is 0.348. During his career, Gattis has faced Wade Miley 13 times with a slugging percentage of 0.538. Gattis on the road is great! His ISO is 0.160 and has a wOBA of 0.317. Gattis hits lefties very hard. His ISO is 0.288 and has a wOBA of 0.357. Signs are pointing up for him today. Tucker Barnhart - C CIN Fanduel: 2400 Draftkings: 3600 - Barnhart goes against Bud Norris at Great American Ball Park (Cincinnati, Ohio). Look for some runs with an over under of 9.5, so expect a high scoring game. Norris has an ERA against switch hitters of 5.59 with a wOBA of 0.378. He's playing poorly big time on the road. His ERA on the road is 6.14 and his wOBA is 0.379. Over the last week Barnhart has scored 11.9 Fanduel fantasy points while his season average is 7.3. He has a batting average of 0.300 and a slugging percentage of 0.500 over that time. Barnhart at home is money. His ISO is 0.225 and has a wOBA of 0.371. Barnhart hits righties big time, to the tune of an ISO of 0.145 and has a wOBA of 0.327. Matt Wieters - C BAL Fanduel: 2800 Draftkings: 3600 - Wieters will go against Collin McHugh at Oriole Park at Camden Yards (Baltimore, Maryland). McHugh has an ERA against switch hitters of 4.90 with a wOBA of 0.354. In addition, he is really struggling on the road. His ERA on the road is 5.23 and his wOBA is 0.352. Salvador Perez - C KAN Fanduel: 3000 Draftkings: 3200 - Perez will be seeing Jose Berrios at Kauffman Stadium (Kansas City, Missouri). Berrios has an ERA against righties of 12.46 with a wOBA of 0.505. Additionally, he isn't doing well on the road. His ERA on the road is 8.47 and his wOBA is 0.381. Perez at home is incredible. His ISO is 0.239 and has a wOBA of 0.363. Perez hits righties big time, to the tune of an ISO of 0.199 and has a wOBA of 0.317. His matchup it too much to overlook. Francisco Cervelli - C PIT Fanduel: 2700 Draftkings: 3200 - Cervelli will be facing Tom Koehler at PNC Park (Pittsburgh, Pennsylvania). Koehler has an ERA against righties of 4.34 with a wOBA of 0.303. His ERA on the road is 4.29 and his wOBA is 0.322. Throughout the last 7 days Cervelli has scored 15.3 Fanduel fantasy points while his season average is 8. He has a batting average of 0.500 and a slugging percentage of 0.643 over that time. Cervelli at home is money. His ISO is 0.057 and has a wOBA of 0.321. Mark Trumbo - OF BAL Fanduel: 3400 Draftkings: 4300 - Trumbo squares off verse Collin McHugh at Oriole Park at Camden Yards (Baltimore, Maryland). McHugh has an ERA against righties of 4.54 with a wOBA of 0.347. Also he has not done well on the road. His ERA on the road is 5.23 and his wOBA is 0.352. Through the last seven days, Trumbo has scored 13.1 Fanduel fantasy points while his season average is 11.5. He has a batting average of 0.136 and a slugging percentage of 0.545 over that time. He also has hit 3 homeruns. Trumbo at home0.283 and has a wOBA of 0.37. Trumbo hits righties in a big way, with an ISO of 0.274 and has a wOBA of 0.377. If you see him starting, try to roster him. Stephen Piscotty - OF STL Fanduel: 3500 Draftkings: 4900 - Piscotty is facing Adam Morgan at Citizens Bank Park (Philadelphia, Pennsylvania). Morgan has an ERA against righties of 7.47 with a wOBA of 0.403. He really isn't doing well at home. His ERA at home is 6.81 and his wOBA is 0.398. During the prior 7 days Piscotty has scored 17 Fanduel fantasy points while his season average is 10.9. He has a batting average of 0.250 and a slugging percentage of 0.600 over that time. He also has hit 2 homeruns. Piscotty on the road crushes it. He has an ISO of 0.176 and has a wOBA of 0.337. Piscotty hits lefties very hard. His ISO is 0.280 and has a wOBA of 0.423. Gregory Polanco - OF PIT Fanduel: 3400 Draftkings: 4600 - Polanco will face Tom Koehler at PNC Park (Pittsburgh, Pennsylvania). Koehler has an ERA against lefties of 3.41 with a wOBA of 0.319. His ERA on the road is 4.29 and his wOBA is 0.322. Polanco at home0.210 and has a wOBA of 0.369. Polanco hits righties in a big way, with an ISO of 0.212 and has a wOBA of 0.35. Andrew McCutchen - OF PIT Fanduel: 3500 Draftkings: 4300 - McCutchen will be pitted against Tom Koehler at PNC Park (Pittsburgh, Pennsylvania). Koehler has an ERA against righties of 4.34 with a wOBA of 0.303. His ERA on the road is 4.29 and his wOBA is 0.322. During their career, McCutchen has faced Tom Koehler 7 times with a slugging percentage of 1.143 with 1 homeruns. During the prior 7 days McCutchen has scored 19.2 Fanduel fantasy points while his season average is 10.2. He has a batting average of 0.391 and a slugging percentage of 0.739 over that time. He also has hit 2 homeruns. McCutchen at home crushes it. He has an ISO of 0.174 and has a wOBA of 0.33. McCutchen hits righties big time, to the tune of an ISO of 0.163 and has a wOBA of 0.326. Look for a big game. Aaron Altherr - OF PHI Fanduel: 2800 Draftkings: 4400 - Altherr faces Adam Wainwright at Citizens Bank Park (Philadelphia, Pennsylvania). Wainwright has an ERA against righties of 4.34 with a wOBA of 0.314. Also he has not done well on the road. His ERA on the road is 6.72 and his wOBA is 0.379. Melky Cabrera - OF CWS Fanduel: 2900 Draftkings: 3300 - Cabrera is facing Kendall Graveman at U.S. Cellular Field (Chicago, Illinois) which ranks number 8 in runs scored and number 13 in home runs allowed. There's a high over under on this game, 9.5, so I think you should expect a lot of fantasy points being scored. Graveman has an ERA against switch hitters of 4.18 with a wOBA of 0.351. In addition, he is really struggling on the road. His ERA on the road is 5.64 and his wOBA is 0.370. Cabrera at home is awesome and his ISO is 0.164 and has a wOBA of 0.354. Cabrera hits righties very hard. His ISO is 0.136 and has a wOBA of 0.327. He should score some big points for you today if he is starting. Michael Saunders - OF TOR Fanduel: 3300 Draftkings: 4100 - Saunders is facing Trevor Bauer at Progressive Field (Cleveland, Ohio). The over under on this game is huge, at 9.5, so expect a lot of runs to happen! Bauer has an ERA against lefties of 4.08 with a wOBA of 0.314. His ERA at home is 4.91 and his wOBA is 0.323. Saunders on the road0.236 and has a wOBA of 0.342. Saunders hits righties big time, to the tune of an ISO of 0.205 and has a wOBA of 0.344. His matchup it too much to overlook.